I can't believe that Thanksgiving is next week! Yesterday, there was a super cute Thanksgiving celebration in my daughter's kindergarten class. Each parent brought in a different dish and we all sat down and ate together after the kids sang a Thanksgiving song. So cute. I contributed the sweet potato and butternut squash mash that we all love so much. We have quite a few butternut squash left from our garden harvest this year, so it worked out perfectly! Having an early Thanksgiving made me start thinking of recipes to share before the big day that you all might be interested in. We are celebrating our own little Thanksgiving tomorrow. Of course, my husband has requested his favorite blueberry pie. I will also be whipping up the beloved mashed potatoes, and several other delicious things. What is your favorite dish for Thanksgiving? Is it something traditional? Or something totally out of the ordinary? These rolls are something that you may want to make as a side for your Thanksgiving. They are my absolute favorite rolls. They are soft, moist, with a hint of sweetness. The addition of sea salt sprinkled over the top right before baking makes them divine. 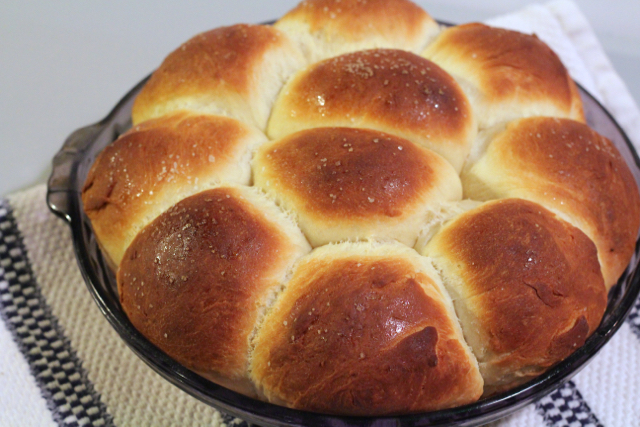 I have been making these rolls for years, and they always get eaten immediately. The perfect compliment to any dish. If you need a make-ahead option for these rolls (to make Thanksgiving day less stressful), head over to Annie's Eats to see how she recommends doing it. In the bowl of an electric mixer fitted with the paddle attachment, combine the yeast and warm water. Add the honey, oil, salt, and egg and mix well. Add 3 cups of the flour and mix just until the dough comes together in a sticky mass. Switch the paddle for the dough hook. With the mixer on low speed, incorporate the remaining 1/2 to 1 cup of flour a few tablespoons at a time. Continue kneading on low speed for about 8 minutes, until the dough is smooth and elastic. Transfer to a lightly oiled bowl, turn once to coat, and cover with oiled plastic wrap. Let rise in a warm, draft-free spot until doubled in bulk, about 2 hours. Preheat the oven to 400˚ F. Mix together the melted butter and honey, and brush the tops of the rolls with the mixture. Sprinkle lightly with coarse salt. Bake for 15-20 minutes until the tops are golden brown. Cover loosely with foil and continue to bake about 10 minutes more, or until the the center of the rolls registers 190˚ F on an instant-read thermometer. Let cool slightly before serving.